The Mercury-in-Fish Scare: How Safe Is All That Seafood You’re Eating? Fish is a go-to protein sources for bodybuilders and other athletes, but rumors swirl that mercury makes eating fish unsafe. Here’s the truth. Bodybuilders and fitness models rely on well-balanced diets that include a variety of fish and seafood to help attain their physical goals. Many types of fish and seafood are extremely low in fat, making them an appropriate, high-quality source of animal protein. Even fattier cuts of fish offer benefits for general health and athletic performance because they contain heart-healthy omega-3 fatty acids. 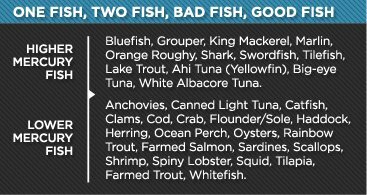 But there's a catch: All seafood contains mercury, a naturally occurring chemical element that can be harmful to humans. With the threat of mercury in fish and seafood, do athletes need to be concerned? Let's fish for answers to some frequently asked questions on the subject. Why the heck are there traces of methylmercury in nearly all fish and seafood, anyway? Microorganisms in the water aid in the transformation of mercury into toxic methylmercury.2 Methylmercury is absorbed by algae, which is in turn eaten by fish and other organisms throughout the food chain. Why do some types of fish contain higher mercury levels than others? What are the concerns about mercury exposure from consuming fish? What are the specific health risks from excessive mercury exposure? What do government authorities have to say about this? Can I reduce my mercury exposure by cleaning and cooking my fish? Does it matter where I buy my fish or cast my line? In Canada, The Canadian Food Inspection Agency (CFIA) conducts routine monitoring of the mercury levels in numerous fish species at fish processing plants before the fish are taken to commercial markets.8 A summary of this data is provided in Health Canada's health risk/benefit assessment document on mercury in fish. Which type of tuna should I consume and why? Tuna mercury levels can vary depending upon the type of tuna and where it was caught. Tuna steaks and canned albacore tuna generally contain higher levels of mercury than canned light tuna.3 This makes sense considering albacore is higher on the food chain than the smaller tuna species that are processed for light tuna. Canned tuna provides a convenient, portable and inexpensive source of protein. Canned tuna packed in water contains a higher omega-3 fat content than oil-packed tuna.9 When buying canned albacore, it's good to choose a water-packed premium wild Pacific albacore from a reputable supplier that tests mercury levels. Although more expensive, specialty brands of canned tuna offer more omega-3 fatty acids, more sustainable fishing methods and higher-quality production methods. What are fish oil supplements, and do they contain mercury contamination? Supplements can provide an alternative option for those who do not wish to consume fish. Test results for various fish oils can be reviewed on the International Fish Oil Standards Website. Optimum Fish Oil is a natural supplement filled with Omega-3 essential fatty acids. Find Optimum products on our store. Take me to the bottom line. Should I stop eating fish and other seafood because of its mercury content? In a word, no: Don't eliminate seafood from your diet. The benefits of modest fish consumption (1-2 servings per week) outweigh the risks among adults and women of childbearing age (excepting a few selected species of fish such as shark, swordfish, king mackerel and tilefish).10 Evidence also suggests that fish consumption and the associated intake of EPA and DHA from fish can help maintain healthy heart function. Fish and shellfish are an important part of a healthy diet. By making informed choices about which types of fish you consume and how often, you can reap the health benefits while minimizing mercury exposure. *For further information about the risks of mercury in fish and shellfish call the U.S. Food and Drug Administration's food information line toll-free at 1-888-SAFEFOOD or visit FDA's Food Safety website. Methylmercury in seafood. Information and Education. © 2010 Whole Foods Market. Agricultural Research Service, U.S. Department of Agriculture. USDA National Nutrient Database for Standard Reference-Release 18 (2005). Washington, DC: US Dept of Agriculture; 2006.